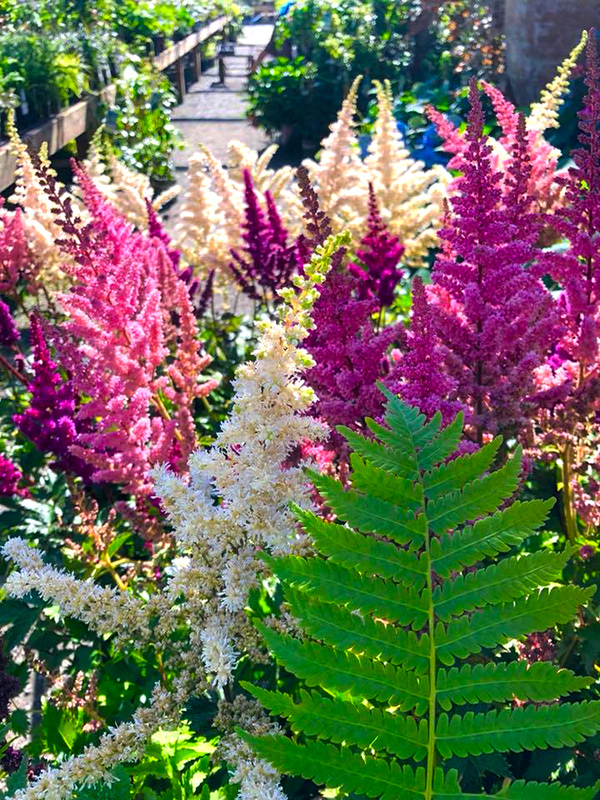 Shade loving astilbes! Photo courtesy of Sunnyside Nursery. I think it is fair to say that for a lot of us, our vision of a shady garden area is one that is mostly green with a few varieties of plants such as rhodies, a couple of ferns, and a hosta or two. The thought of a diverse mix of plants with colorful foliage, contrasting textures and even some flowers is a reach. A monochromatic blend of plants is the most we can hope for. Well, I am here to tell you that nothing could be farther from the truth and here are some prime examples to try out. For vertical excitement, nothing beats some of the shade loving Japanese Maples. Or for that matter, our native Vine maples will work too. I have a Hydrangea aspera just coming into bloom that has a strong vertical growth habit, very large lace cap blooms, and peeling bark that also provides some winter interest. Mine is currently 10 to 12 feet tall. The sweet little Cornelian Cherry and Witch Hazel are both small trees that will do just fine in the shade. For shrubbery, nothing can beat the fragrance and attractive glossy evergreen foliage of both winter Daphne or Sarcococca. If you want something a bit showier, try one of the varieties of Aucuba or Gold Dust plant with its large green leaves that have been splashed with bright yellow spots. Spider Web Fatsia has tropical looking foliage that is an incredible blend of white and green leaves or you can plant a Sundance Mexican Orange with its golden leaves and spring blooming, fragrant white flowers. Many conifers in the hemlock and yew families are very shade tolerant and provide a nice textural contrast to those above mentioned glossy-leaved shrubs. There are many other options just waiting to be discovered. After you have placed the bones (shrubs and trees) you can start accessorizing with an amazing array of perennials like hostas, astilbes, ferns, bleeding hearts, and Japanese anemones. For a bit more drama try out a dark leafed “Black Negligee” bugbane that blooms in August with a deliciously fragrant bottle-brush like flower on a six foot tall stock. Or to contrast your bugbane, plunge in a golden “Sun King” Aralia cordata, which will grow six feet tall in one season. Don’t forget the ornamental grasses, which always liven up any planting, sun, or shade. My favorite is “All Gold” Hakenochloa, but Black Mondo grass and a newer sedge called “Everillo” will also do the job. If you have any room left, try filling in with a low growing groundcover like “London Pride,” a delightful spreader or golden “Creeping Jenny.” The absolute last thing I want to see in my garden is bare soil. It’s a wasted opportunity as far as I am concerned. Finally, don’t forget that there are shade-loving annuals that will bloom for us all summer long like impatiens, begonias, coleus, and fuchsias. If your soil is riddled with tree roots, try setting out some colorful glazed containers and planting your seasonal color in them. The rich potting soil and consistent feeding will give you much better growth. As you might suspect, I have barely scratched the surface when it comes to having a colorful and attractive shade garden. Don’t settle for boring green when you can have so much more. Check out your options at the local garden center and get started jazzing up that dark shady side of your yard. Sunnyside will be hosting a free class, “How To Attract Hummingbirds and Butterflies,” Saturday July 28, 2018 at 10:00 am.